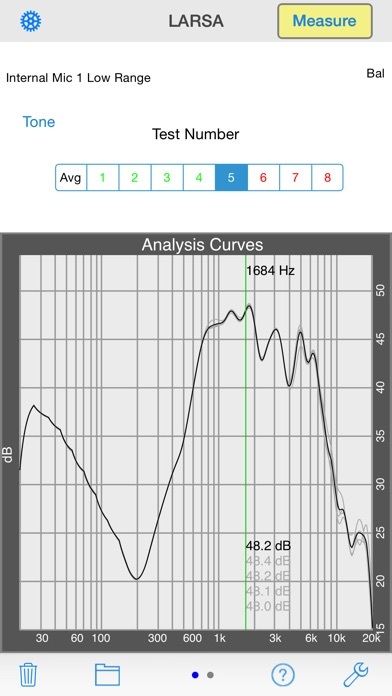 LARSA, or Loudspeaker And Room System Analyzer, is a powerful impulse response measurement and analysis tool. It is ideally suited for measuring loudspeakers in rooms, multi-speaker setups, car audio systems, home theater systems or larger, installed loudspeaker systems. It is an easy way to profile a system and give you the information you need to equalize or tune your loudspeakers for the best possible performance in your listening space. LARSA brings measurement power and convenience previously available only on desktop computers. Easy-to-learn single-tap recording of an impulse response. IR averaging features. Perform test/re-test analyses of measurements or a make a spatial average. Delay time calculation for time-alignment in bi- and tri-amp applications. Full iCloud support for easy access to your measurements on your desktop or laptop.